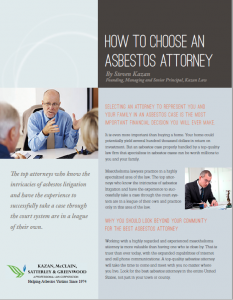 Mesothelioma lawyers representing the victims of asbestos exposure and their families practice in a very specialized area of the law. Mesothelioma law is a narrow practice area focusing exclusively on asbestos related lung cancer, often a result of occupational exposure or military service. The following chronicles some of the reasons to hire Kazan Law as your legal representative. Our mesothelioma attorneys have been instrumental in shaping the law to ensure that present and future victims of mesothelioma will have the opportunity to seek justice in the court system. Our attorneys have also played a crucial role in the development of trust funds to pay claims for bankrupt asbestos companies. Kazan Law is consulted by and gives advice to more than a thousand potential clients each year. We have filed more than two thousand cases in our history. We are proud that our California mesothelioma law firm Kazan Law is large enough to have extensive resources and many years of experience, yet small enough to ensure—by limiting new cases to 20–25 per year—that every client receives individual and outstanding representation. At Kazan Law each case is individually developed and handled by a select group of lawyers, paralegals and investigators. This team has the resources of the entire office to draw upon, including professional investigators and extensive databases.